After a very difficult pregnancy in which I had a massive blood clot completely surrounding the amniotic sac from 15 weeks on, I was told every. single. week. that I could lose him any time. To the medical specialists, there was just no way he could make it. They pretty much said it would take a miracle to even make it to 24 weeks. God granted that miracle. My water broke on Monday night, Memorial Day at 28 weeks. The next day and a half were spent in Labor and Delivery on magnesium sulfate, unable to eat, drink, or even barely open my eyes because of the terrible dizziness and double vision that accompanied the mag. It was rough. I remember Tuesday night, while on the phone with my husband, just having a complete meltdown. He was home with Lydia. I was alone. I had reached the point that I didn't even know what to pray for. Being in the hospital away from my family was torture as Lydia was only 20 months old. But then Caleb needed every day extra in utero possible to grow and get stronger. We prayed together on the phone and just submitted to whatever the Lord thought best. Around 5:00pm on Wednesday evening, I began to have contractions again. Strong contractions. I started watching the clock. Five minutes apart. Not good. Then I really started paying attention. After a little while they were 3-4 minutes apart. I called the nurse. The first thing the nurse did was take my temperature. I had a fever...a sure sign that infection had set in. The doctor came and told me Caleb was better off outside than inside at this point. Back I went to Labor and Delivery. Hubby looked at the monitor...my blood pressure was 50/23. It's only of the Lord's mercy that I was awake and coherent. Nobody knew yet that I was bleeding internally. Around 11:00pm, it was becoming obvious that Caleb was in distress. His heart rate was up and down all over the place. I will never forget the tension in that room. My doctor, usually positive and upbeat, was grave. That fact alone scared me. As the whole room kept their eyes fixated on the monitor and Caleb's heartrate, we were all alarmed when it started dipping into the 60's and taking longer and longer to come back up. Then it hit 40 and very, very slowly started climbing. That's when the doctor realized something was very wrong. He checked me and the hemorrhaging that was happening internally had begun to show on the outside. I had had a placental abruption, a condition that was life threatening to Caleb and myself. The doctor turned to the nurse and said, "Let's go!" It was 11:35. Suddenly, it seemed like my life turned into something I had seen in a movie. People were running everywhere and I was flying down the hall in my bed. Someone handed me a tiny cup and yelled, "Drink this." It was disgusting. I looked back and there was my sweet husband, waving at me and signing "I love you." I watched him until the double doors closed behind me. The swarm in the OR was surreal. There were between 20-25 people in that room. And everyone was in a mad flurry of activity. Someone was strapping my arms down. Another person was inserting IV's. A lady with blonde hair was taking my blood from my other arm. An oxygen mask was strapped to my face. Someone else put my hair up and covered it with a blue surgical cap. Curtains were flying up. I felt someone pinch my stomach and say, "Can you feel this?" I said yes and I heard him say to someone, "Crank her up!" (Meaning up the meds.) At my head was an anesthesiologist stroking my hair and trying his best to comfort me. I just kept asking my for husband, knowing somehow that he wasn't allowed to come. Then I heard in shushed tones, "Quick, grab the feet." I knew then that he was born. A nurse hollered out the time of birth....11:38. He never cried or made a noise. There was just a swarm of people over on the side of the room working feverishly. Finally a neonatologist came and told me that he was alive and doing okay. 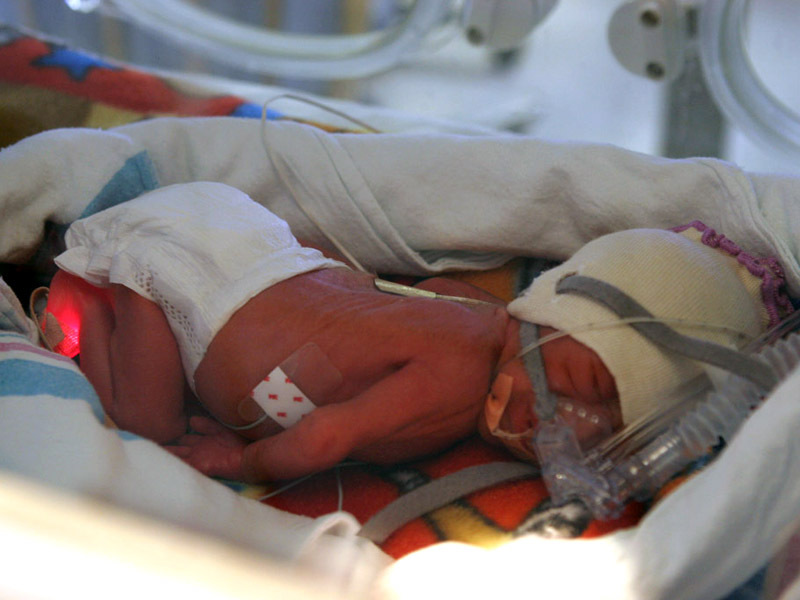 They had had to resuscitate him and now he was on a portable vent and on his way to the NICU. Then he began to tell me all the things they were going to do to him when he got there and all the things that could be wrong with him because of his prematurity and traumatic birth. It was alot to digest while being operated on. Later, I finally saw my husband in recovery. He though, was the first one to see Caleb as they rolled him to the NICU. He was able to snap this quick picture. Later, in the middle of the night, I think around 4:30am they rolled me down to the NICU on my bed so I could get a peak at him. It wasn't until late Thursday night that I was well enough to go in a wheelchair to see Caleb again. He was already off of the vent and on CPAP. He had already had a spinal tap, an ultrasound of his brain, and lots of blood work. He was also very ill with E.coli sepsis and on seven different I.V. antibiotics. Despite all of that, he was asymptomatic and extremely feisty. He was so tiny, but beautiful and perfect. His birth weight was 889 grams or 1lb. 15.4oz. Here's a little video of him at five days old when he was strong enough to really be touched. Right after that video, the nurse said he was stable enough for me to hold him for the first time! And that's where the slideshow below comes in. When Caleb was three weeks old, our church threw a baby shower for him. Steven made this little slideshow with music as a surprise for me and played it at the shower. (I still cry every time I watch it!) The pictures begin from my first time ever holding him up until he is three weeks old. At 10 weeks old and 4lb. 10oz., Caleb finally came home. He was nursing like a champ and only had to come home with an apnea/bradycardia monitor, and a few medications, like caffiene. God is so good! So...how to describe Caleb now at six years old??? Caleb is just pretty irresistible...his contagious laugh, his ready smile, his sweetness to his baby brother, his "I'm the man" attitude, his constant energy...you can't help but love him! Happy Birthday Caleb...we love you!! What great memories. The video is excellent. God is sooo good!!!! I can't believe how much he has grown up! By the way, I love the shirt he has on...anyways, please tell him we all said Happy 6th Birthday! The kids have been asking about all of them maybe we can get them together one day. Thanks for sharing this, he's one of God's miracles! Never heard this story, Laine! So precious!